U.S. president Donald Trump reiterating his complaint that oil prices are too high - which caused substantial price losses on Monday - has apparently all been forgotten as U.S. crude on Thursday rose for the third straight session, tempered somewhat by the usual concerns over tensions between the U.S. and China and the latter country showing signs of an economic slowdown. 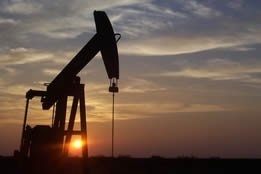 West Texas Intermediate rose 28 cents, to settle at $57.22 per barrel (almost enough to obliterate the losses caused by Trump), Brent however declined by 36 cents to $66.03 per barrel. Adding to the list of headwinds on Thursday was news from the Energy Information Administration that U.S. crude production rose more than 2 million barrels per day (bpd) in the last year to a record 12.1 million bpd - and while this was offset by a surprise 8.6-million barrels drop, "a second straight big build at Cushing bears watching," wrote Paul Sankey, oil equity analyst at Mizuho Securities, in a research note. While these headwinds suggest that oil prices are range bound for the time being, John Driscoll, director of JTD Energy Services, believes they could fall in the second half of this year - with the U.S. to blame. Driscoll told CNBC television that this is because "U.S. producers continue to increase as these prices move up, but more importantly the capacity constraints on pipelines, on terminal space....as those bottlenecks are cleared, you're going to see those U.S. exports increase." He added, "The U.S. is spoiling the OPEC party; they are now the wild card and they don't have a seat at the party in Vienna." Ironically, it fell upon OPEC's secretary general to give the Americans their due in positively affecting the global energy market. Mohammad Barkindo told media in Riyadh that while his cartel "literally rescued this industry from total collapse" thanks to its production cutbacks, he credited the U.S. shale revolution for helping to prevent "major, major energy chaos." He added, "Thanks to the shale revolution we have been able to maintain these supplies and meet current demand; what is needed now is for us to continue this relationship with the non-OPEC [producers] in order to sustain the relative, and fragile, market stability that we have been able to achieve."